I had an unexpectedly brilliant day on Saturday - don't you just love when that happens? The plan was for Will to do a century ride with the guys, while the kids and I run a local 5 km race with the double stroller (which would have been tons of fun too! 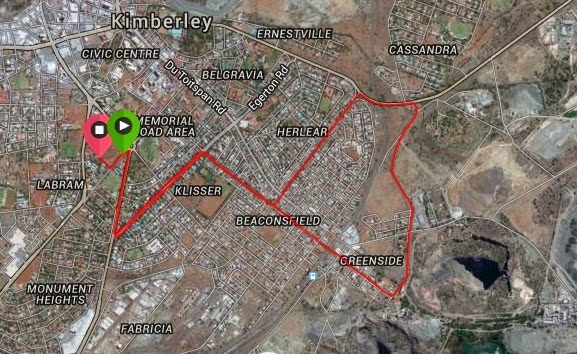 ), but a nasty cold forced him to stay at home and gave me the opportunity to fly solo at a local 10 km race instead. 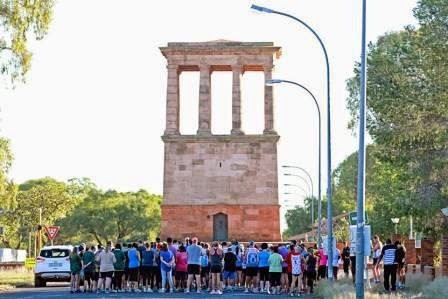 The race was our provincial 10 km championships, but since races in our part of the world are few and far between, runners of all abilities were encouraged to enter. The turnout ended up being pretty good too, with 101 runners of all shapes and abilities lining the streets on race day - yay! It was actually a bit premature for me to be racing a 10 km, since I spent the last month or two focusing on shorter, faster runs, and neglecting the longer distances. But I was so curious to see if my tempo runs are paying off yet, so I just had to give it a go. I lined up towards the front of the field (behind the racing snakes, ahem), and was thankful for a familiar route - I could literally just switch on auto pilot (no searching for little red-and-white route markers) and go, go, go! After a quick route briefing and a prayer, we were off. I started off at a fast (for me), but manageable pace (more or less my tempo run pace for the past few weeks), but got a bit of a fright when I peeped at my watch and saw that I was running a sub-5 minute/km first kilometre... Oops! Too fast, too soon, Girl! So I took a deep breath and tried to calm down. Kilometre two was a bit more under control, with my pace hovering just above 5 minutes/km, and after that I felt comfortable enough to pick up the pace just a little bit and keep it there until Kilometre 7. I anticipated that I wouldn't be able to hold a sub-5 minute/km pace for the entire 10 km, since my longest tempo run at a similar pace had only measured 4 km, but dang, I tried my hardest! Post-race, all kitted out in my new club gear. Although I missed a sub-50 minute finish time, which I've been dreaming of for so long, I'm beyond ecstatic with a new PR and the progress that is happening. 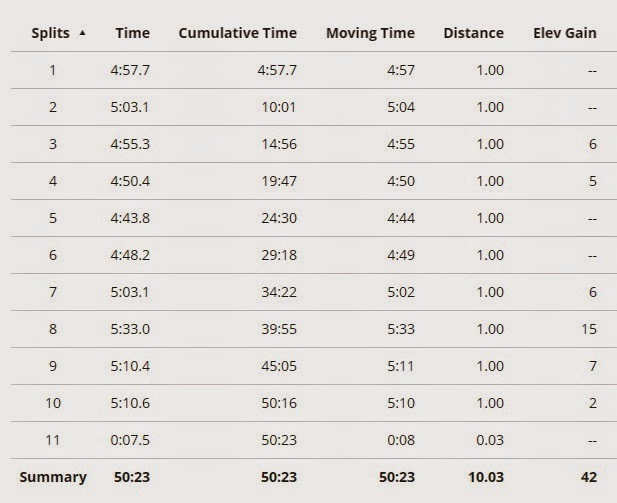 For the first time ever I feel like a sub-50 minute 10 km is actually a possibility (perhaps towards the end of the year?) if I put in the hard work. And, guess what? Since it was a circle route, I had no idea of my placement until the race results were posted on the Internet, buuuuuut: I finished under the Top 5 women!! Move over, Jo Pavey, haha! Thrilled, thankful and happy like a little kid. Man, I love running! SaRa, jou tyd is dan eintlik 50.13?! Daai ekstra sekondes was die 30m wat jy te lank gehol het??? Dis verby fantasties! Ek dink as jy daai een split van 4.43 bietjie stadiger gemaak het was jy loshande onder 50min. 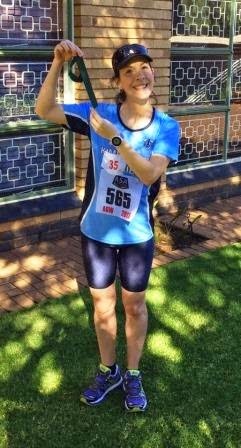 Jy's reg - my pacing kon beter gewees het. Dink die 4.43 split was met 'n geleidelike afdraande - sal volgende keer fokus om daar 'n bietjie krag te spaar vir die opdraandes.